GeekStorage Review 2019: Is GeekStorage a Good Hosting? GeekStorage has clearly invested much time and thought into creating a custom server stack optimized for performance, efficiency, and security. A privately-owned company headquartered in Norman, Oklahoma, this small web hosting provider is on a mission to provide high-end performance hosting optimized for developers. GeekStorage was founded in 2007 by industry veterans Jay Higdon and Matthew Eli. They’re a privately-owned company headquartered in Norman, Oklahoma, with three datacenters located in the U.S. and another in Europe. Their mission is to offer high-end performance hosting optimized for developers. Their web hosting plans come withthe typical features: 99.9% uptime guarantee, PHP and Ruby support, and a generous amount of SSD storage space and bandwidth. As a nice perk, they also throw in RvSiteBuilder and Site.Pro website builder installations even with their cheapest, most basic plan, and all plans include daily off-site website backups. One thing I was surprised by was their Let’s Encrypt SSL feature and full e-commerce support, typically only found in higher-priced plans but included for free in their entry-level plans. One of the best features of GeekStorage is the amount of time and care they’ve clearly invested into creating a custom server stack for optimum performance, efficiency, and security. They use SSD storage coupled with RAID 10 protection for all their servers, so you’ll get only the fastest loading speeds and excellent data integrity. 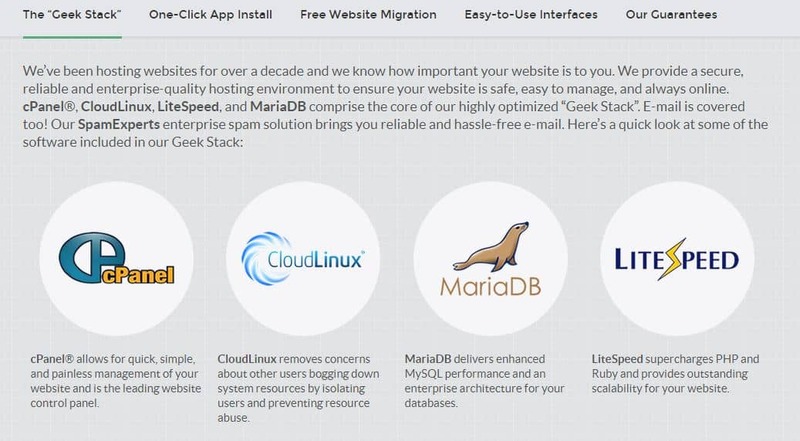 All of their servers employ LiteSpeed and CloudFlare for the best performance and protection, and they run on a CloudLinuxoperating system (in place of the industry-standard Apache web server), which adds to server security and stability. GeekStorage uses the popular web hosting control panel cPanel, so users should have no problem navigating the interface. They also employ Softaculous for theirservers, which enables the one-click installation of over 440 of the most popular apps. Their unlimited plan basically removes the resource limits from their plans, so you’ll get virtually unlimited SSD storage space, bandwidth, subdomains, email accounts, andMariaDB databases (a much faster replacement for MySQL). However, nothing is truly unlimited – so I did appreciate that GeekStorageactually listed the generous caps on their inodes (file count), processes, and memory, even if it did contradict their plan labeling. In their performance hosting packages, the emphasis is on server speed. Here, the plans are slightly pricier compared to their unlimited plans, but you get access to a lot more resources, such as virtual memory and inodes. The premium management plan is the most expensiveoption, of course, but it takes care of every aspect of maintaining a VPS server. Do note that you’ll also have to purchase licenses for your control panel and operating system. Upgrading or downgrading your plans is a quick, hassle-free process; you can switch plans at any time via the account management portal.GeekStorage also offers a 30-day money back guarantee with no questions asked. GeekStorageprovides customer support in the form of an extensive knowledge base, video tutorials, blog, email channel, and around-the-clock support ticket system. Support was prompt and friendly; most of the issues I brought up were resolved within a few hours. Unfortunately, they don’t have a live chat option and they tend to steer customers away from their phone line, so that may be an issue for certain customers who need to get a hold of a support representative quickly. Though a relatively small setup, GeekStorage has upgraded their servers and hosting packages considerably over the years they’ve been active. Their high-end servers and expert technical service will appeal particularly to developers who care about getting the most out of their hardware. Wondering how GeekStorage stacks up against other Web Hosting companies? Enter any other Web Hosting company and we will give you a side-by-side comparison.